Wednesday's here again!! Yay!! Let's get going! into a little pillow! I love the fabrics! It's a new Moda line called Hometown (I think) and it is darling!! A perfect 3.5" HST. No. Trimming. Required. At. All!!!! **angels start singing** I asked my hubby if he realized how much time it was going to save. His exact answer was, "Well, based on the amount of time you spend quilting, I'll just guess a few thousand hours or so." He's right. I love them both! I love how this quilt is coming out SO much!!!!! When I started I had a thought about who I might give it too. But I am loving it so much that I want to keep it. I have no need for it. I have no real place for it. Everything points to the fact that I shouldn't keep it. Am I going to keep it anyway? You betcha. SBS: Bowties! This was fun, and I like how the block turned out! Finally, I started the cutting on this! I have a few more of the applique pieces to cut out, but that shouldn't take too long! Glad to finally have this one started! Yea! Other stuff: I made some curtains for the kids rooms. I'll post pictures sometime soon! So that's all! I will be taking my sewing machine in for a service Thursday, so that it can be all tuned up while we are on our last vacation of the summer! We are leaving Friday morning, so I'll be a week or so late on the last Summer series block :( But, we are going to have some major fun! So, I'll be absent all of next week! I'll miss you all! 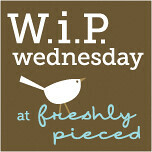 Be sure to check out all of the awesome WiPs over at Freshly Pieced!! Cheers! Wow! What a great week. I can't wait to win a Go! Baby too! -- I may just have to buy one with all the great projects out there. 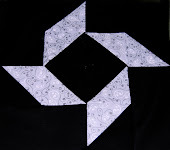 Thanks for posting the pic on the half square triangle die. Wow! LOVE your Halloween colors. Can't wait to see more of that quilt. I also wish I was as caught up as you on my Summer Sampler Series. I'll get there. School will be back in session soon and I'll have more time. yummy fabrics on the pillow too! You've convinced me to try the HST die too. The angels singing did it. I have some Hometown in my stash waiting patiently for me to use it. Love the bright colours in your Summer Series blocks. I said the same thing about this week not feeling like I'd done much! Must be in the water. But you've done a lot and it looks great. LOVE that Evening Star. Gor-geous! And I'm even more jealous of your Go! if you're making HST's that easily! Oh man, I love how easy you're making HSTs sound...especially when I've got so many that are glaring at the me at the moment! So glad you're enjoying your Go! I really love your Summer Sampler blocks, they look great! Have a super fab vacay!! Dang, I think I need the HST die too! Your blocks are looking great! 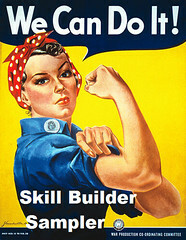 Your blocks are beautiful! I am going to have to make some of those summer sampler ones, they are too good to pass on. I do love the fabric in your little pillow top! I am going to have to consider getting a Go cutter. I will have to save up for it. Looks like you have been very productive to me. I am still away and can't wait to get home to sew! I miss it and my blog reading. Love the WIPS.. have fun with the GO!! I love your diamonds! I cut mine all by hand, so I am sure yours is waaaaay more accurate lol! I love all of your fabric choices too! That HST die works wonderfully. Perhaps i have to break down and buy the Go baby after all, since I didn't have it down for my birthday in July.